Last week, Mark Fisher introduced you to the new restructured and simplified Spring Integration samples that came out with the new release of Spring Integration 1.0.3 and so far the feedback was very positive. Beside restructuring and simplifying existing samples we’ve introduced few new samples with the goal of demonstrating some of the benefits of running Spring Integration on OSGi-based platforms. In this blog using very trivial, yet powerful example we’re going to look at some of the benefits of Spring Integration and OSGi when used together to address dynamic nature of today’s enterprise. Spring Integration is a POJO-based light weight, embeddable messaging framework with a loosely coupled programming model aimed to simplify integration of heterogeneous systems based on Enterprise Integration Patterns and without requiring a separate ESB-like engine or proprietary development and deployment environment. On the other hand, OSGi is a paradigm that allows one to compose loosely coupled systems from independent modules called OSGi Bundles. Composing systems from the set of independently developed modules might not be such a new paradigm, we’ve been doing it (hopefully) for a number of years. Having said that, the realization of true benefit of OSGi modularization will come not from its static packaging model, but from understanding its deployment and run-time dynamics and how well it is positioned to address the dynamics of today’s business processes. So, let’s see on the simple example how integration based on message exchange and dynamics of OSGi can complement each other allowing for realization of very powerful and dynamic system. Spring Integration samples come with the distribution of Spring Integration. You can also download them independently from here. For simplicity these samples were developed as SpringSource Tool Suite (STS) projects while utilizing dm Server tools for quick integration with SpringSource dm Server - an OSGi and Spring based Enterprise Java Platform. However being OSGi compliant based projects these samples will adequately run on any properly configured OSGi platform. First, let’s make sure we have a properly configured development/deployment environement. 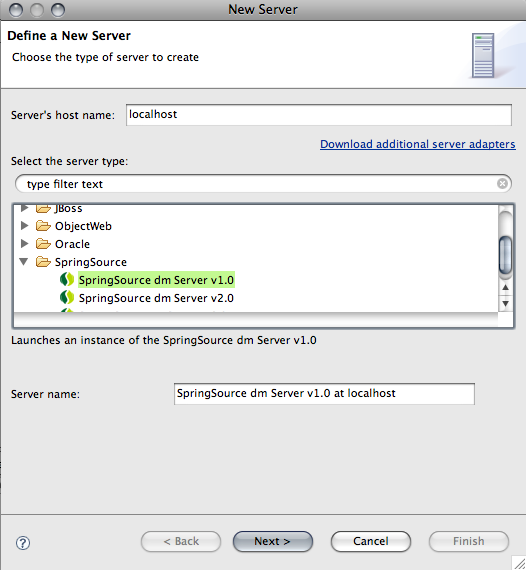 Spring Source Tool Suite v2.1.x will come with SpringSource dm Server already pre-configured, however understanding how to configure it manually still helps. 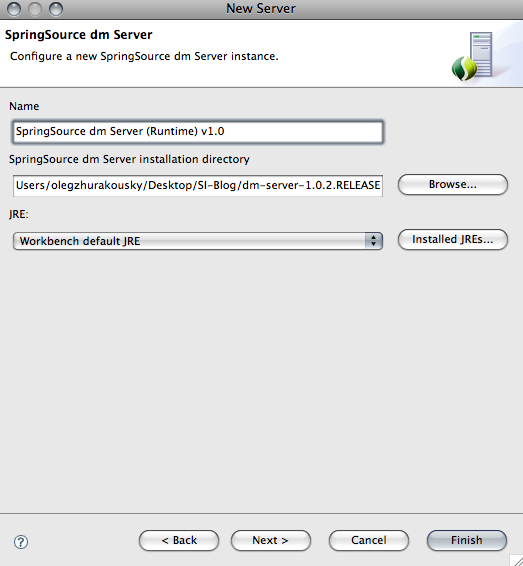 You now have SpringSource dm Server configured within STS environment. Start dm Server and make sure it starts successfully and that there are no errors. 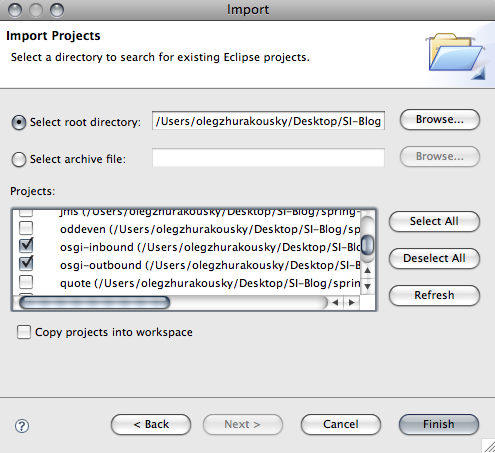 It is assumed you already downloaded Spring Integration samples, so let’s import the two sample projects into the workspace using Import Existing Projects into the workspace wizard provided by STS/Eclipse. Click Finish You should see two projects with errors. These errors are expected simply because our projects are not aware of dm Server Target Runtime and our dm Server Target Runtime is not aware of Spring Integration bundles. Let's solve one issue at a time. 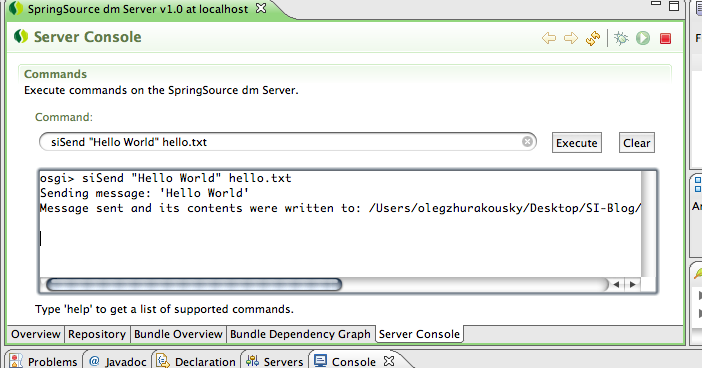 First lets make dm Server aware of the Spring Integration by deploying Spring Integration and dependent bundles into dm Server's repository. This is a very simple process. Copy org.springframework.integration-1.0.3.RELEASE.jar and org.springframework.integration.file-1.0.3.RELEASE.jar (the two bundles our samples depend on) into dm Server's repository/bundles/usr directory. Then in the STS's Server view double click on the instance of the dm Server -> Click on Repository tab and in the right top corner you'll find a Refresh button. Click on it and you should see the two bundles available in the dm Server's repository. Now we need to make our bundle projects aware of our new Target Runtime. Now all the errors should disappear. These two samples built on very simple and familiar producer/consumer concept. The first bundle osgi-inbound is a producer which will allow you to produce a message that will be sent to a message channel. The second bundle osgi-outbound is a consumer and will consume a message placed on the channel by osgi-inbound bundle and will write the message to a file. Now you are ready to test the functionality provided by these bundles. To make it more interesting we’ve enabled Command Line Interface (CLI) via OSGi console which allows you to interact with osgi-inbound bundle by providing a command, the message and the file name you want the message to be written. Go and verify that the your message has been written to a file. This very simple and trivial concept demonstrates the loosely coupled integration between the two systems based on the messaging model provided by Spring Integration. However in the real world one of the issues that we have to face while trying to integrate the two systems is the independent life-cycle of such systems where change in their behavior, addition of new systems and/or end of life of the old systems is a normal occurrence. Typically such changes require, not only code changes, but redeployment of the entire monolithic (e.g., EAR, WAR ) application following the complete server restart. Spring integration’s POJO programming model is very well suited to address loosely coupled nature of these system where change to one system rarely affects another one. However what about its life-cycle dynamics? Lets assume that the requirement (within the scope of our little sample) as to where or how the files have to be written has changed. Both “where” and “how” is the responsibility of the osgi-outbound bundle. Under normal circumstances, any change to the functionality of the osgi-outbound bundle would require complete refresh of the system (i.e., redeployment of the entire system and server restart). It might not be such a big problem when your system is comprised of only two bundles. But what if its more then two? Are you prepared to rebuild and redeploy the entire system packaged as WAR or EAR simply because the directory where messages have to be written has changed or a new sub-system which should log every incoming message was introduced? As you can see, a very simple configuration which defines a Gateway Proxy allowing for a POJO way of sending a message that will be deposited to an inbound channel configured as publish-subscribe channel. However what makes it even more interesting is that this channel has been exported as a service to the OSGi Service Registry via element, thus allowing for much loosely coupled yet dynamic cooperation model between the current and future bundles. Let’s also review the Application Context configuration of osgi-outbound bundle. The goal of this bundle is to dynamically subscribe to a channel advertised by the osgi-inbound bundle as soon as this bundle comes up and write a message to a file in the directory configured by the <osgi:service/> element, thus accounting for a dynamics provided by OSGi Services layer. As you can see in this configuration the ‘inboundChannel’ OSGi service exported by the osgi-inbound bundle is now imported via <osgi:reference/> element. Remember, although in this trivial example we are only dealing with two bundles, these types of producer/consumer bundles could themselves be gateways to other parts of your system and these parts are naturally dynamic. As an example, lets assume you want to receive an email notification about the file being written. With SI and OSGi, the only thing you would need to do is create another bundle to represent that part of your sub-system as a consumer to the channel service advertised by osgi-inbound bundle, and when you don’t need it - unsubscribe, by stopping or undeploying this consumer without affecting the rest of your system. In fact go ahead and try to develop another bundle as a consumer to the osgi-inbound or use your imagination and develop another bundle that will do something with the file that was written by the osgi-outbound bundle. Most importantly - Happy Integration!! !